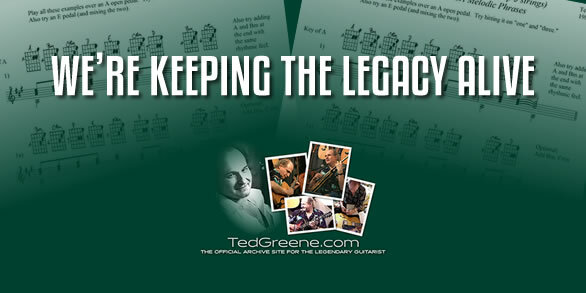 For over ten years, TedGreene.com has provided the only comprehensive repository of everything Ted Greene, from lessons and transcriptions to audio and video recordings... and so much more. TedGreene.com and the Ted Greene Forums have welcomed hundreds of thousands of guitar players and enthusiasts from around the world who have benefited from the content we've delivered freely over the years. That has been and continues to be our goal. Moving forward, we expect to upgrade, expand and improve the TedGreene.com platform in many ways, but we'll need your support to make it happen. We've always depended on contributions from folks like you and that has not changed. What has changed is the continued growth of interest in Ted's work, the technology that brings it to the world and the cost to keep up with it and keep it going. So your support is more important than ever. Please make whatever contribution you can knowing that any amount is immensely appreciated. Just click the Donate button below. Have questions about donating to TedGreene.com? Feel free to email us. We're always happy to hear from you. Contributions keep the site up and running and are gratefully appreciated.